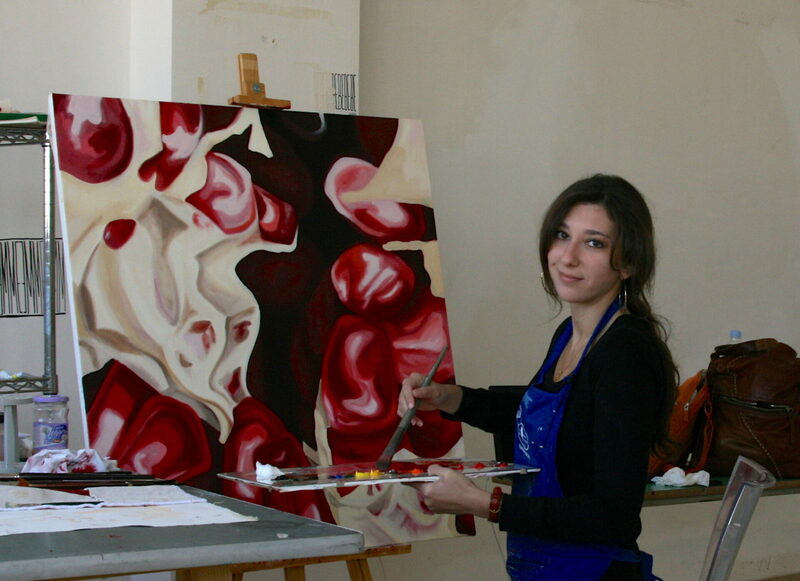 Angela Faustina and her Melagrana (Pomegranate) IX oil painting on canvas in her studio at MIRA: International Residency for Artists in Martignano, Italy, in 2011. Angela Faustina’s sticky sweet oil paintings transform glistening fruit into its own vibrant world. Capturing juicy pulp at the peak of ripeness highlights the beauty and vibrancy of life. Her paintings are intimate, surprising, enigmatic, and bold as hell. Angela Faustina is an ultra-contemporary realism artist whose paintings have been internationally collected and exhibited since 2006. She is represented by Signet Contemporary Art in London, England, UK and gallery43 at The Loft in Marietta, Georgia, USA. Her juicy murals are on view in some of the most vibrant neighborhoods of the southeastern United States, including Atlanta, Georgia, and St. Petersburg, Florida. Faustina lives and works in the Greater Atlanta area but her vivid color palette will always reflect growing up in South Florida, USA. Follow the artist on Facebook and Instagram to see inside her art studio and learn where she’s next exhibiting her artwork. * Stars denote a solo or three person exhibition; otherwise it is a group exhibition. Angela is represented by gallery43 at The Loft in Marietta, Georgia. Upcoming: Fresh Contemporary Art Fair, represented by Signet Contemporary Art, Cheltenham, UK. Upcoming: Affordable Art Fair Hong Kong, represented by Signet Contemporary Art, Hong Kong. Upcoming: Affordable Art Fair Singapore, represented by Signet Contemporary Art, Singapore. MINI, Mize Gallery, St. Petersburg, FL. Affordable Art Fair NYC Spring, represented by Signet Contemporary Art, New York, NY. Various exhibitions, gallery43 at The Loft, Marietta, GA. SHINE Mural Festival Exhibition, Morean Arts Center, St. Petersburg, FL. Various exhibitions, gallery43, Roswell, GA.
For the Love of Art PopUp Show, The Brickyard, Marietta, GA. Various including Bare, Remix, Emerge, Branded, and Wonder, gallery43, Roswell, GA.
Open juried exhibition, Kudzu Art Zone Gallery, Historic Norcross, GA. ARTicles: Leslie Curran Gallery, St. Petersburg, FL. Garden Art Party, BlueLucy Gallery, St. Petersburg, FL. Art & Soul Benefit Exhibition juried exhibition presented by Business of the Arts of Broward, GalleryOne, Ft. Lauderdale, FL. Landscape, BlueLucy Gallery, St. Petersburg, FL. Femme Fantasy Juried Exhibition, Soft Water Studios, St. Petersburg, FL. Simply Original Juried Exhibition, Art Center Sarasota, Sarasota, FL. New College of Florida Senior Thesis Art Exhibition, Art Center Sarasota, Sarasota, FL. OPEN Art Show, New College of Florida, Sarasota, FL. 13: An Art Exhibition featuring the Watershed Collective, New College of Florida, Sarasota, FL. New Editions, Bleu Acier Inc., Tampa, FL. Yearn, Crossley Gallery, Sarasota, FL. Faces. Spaces. Sound. New College of Florida Thesis Group Show, Isermann Gallery, Sarasota, FL. Printmaking juried exhibition, Isermann Gallery, Sarasota, FL. Student Art Show, Isermann Gallery, Sarasota, FL. Open Studio Exhibition, Parsons: The New School for Design, New York, NY. “12 by 12” juried exhibition, Isermann Gallery, Sarasota, FL. SHINE St. Pete Mural Festival at Greenbench Brewing, St. Petersburg, FL. Marietta Trail to River Festival at Kiosco Restaurant, Marietta, GA. Stacks Squares Mural Project, Cabbagetown, Atlanta, GA. Drink & Doodle vol. 60 participating artist, ABV Gallery, Atlanta, GA.
Meet the Artist + DRAFTS host, Green Bench Brewing Co., St. Petersburg, FL. Tuesday, March 12. Featured Artist: SHINE St. Petersburg Mural Festival, St. Petersburg, FL, 2018. Featured Artist: PeachDish Artist Series, 2018. Featured Artist: Marietta Arts Council M2R Trailfest mural, Marietta, GA, 2018. Featured Artist: Stacks Square Mural Project, Cabbagetown, Atlanta, GA, 2018. Featured Artist: ArtForCharity.org non-profit organization. 100% of art merchandise profits go toward charities like Lupus Foundation of America, 2018. Artist’s Talk: BRANDED with Craig Ford and James Gilbert. gallery43, Roswell, Georgia, 2017. Artist’s Talk: METHOD with Sabra Esler, Kyle Hicks, and Beth Bush. gallery43, Roswell, Georgia, 2017. Artist Residency: Martignano International Residency for Artists, Martignano, Italy, 5 months, 2011. Artist’s Talk with Tinsley Hammond. Eterarte and MIRA: International Residency for Artists collaborative event, Martignano, Italy, 2011. Artist’s Talk: Transience, Fragmentation, and Fruit. Mildred Sainer Arts Pavilion, Sarasota, FL, 2009. Award: NCF Academic Scholarship, New College of Florida, 2005 – 2009. Award: Bright Futures: Florida Medallion Scholarship, 2005 – 2007. Award: College Board: AP Scholar with Honor Award, 2005. Angela Faustina on the front page of the Marietta Daily Journal, April 14, 2018. “Holiday Gift Guide,” Creative Loafing Atlanta, December 2018. “It’s a wrap! A fine SHINE and a very crowded arts calendar,” The St. Pete Catalyst, October 12, 2018. “Here are the new artists for SHINE Mural Festival in St. Petersburg,” Creative Loafing Tampa Bay, October 4, 2018. “Fall Art Preview,” Tampa Bay Business Journal, September 2018. “Arts Alliance announces St. Pete SHINE muralists,” Tampa Bay Business Journal, August 30, 2018. “SHINE ’18: Shorter but bigger, international, inclusive,” The St. Pete Catalyst, August 30, 2018. “Here are the new artists for SHINE Mural Festival in St. Petersburg,” Creative Loafing Tampa Bay, August 2018. “Paint the Town: Marietta Brings Blank Walls to Life with Long-Awaited Mural Art,” Cobb Life Magazine, July 2018. “Local Artist Spotlight: Angela Faustina,” Roswell Magazine, May/June 2018. “The Atlanta Arts & Culture Weekly Review,” VoyageATL, May 2018. Guide to Good Times: Official Guide to Roswell, Georgia, City of Roswell, GA, 2018. 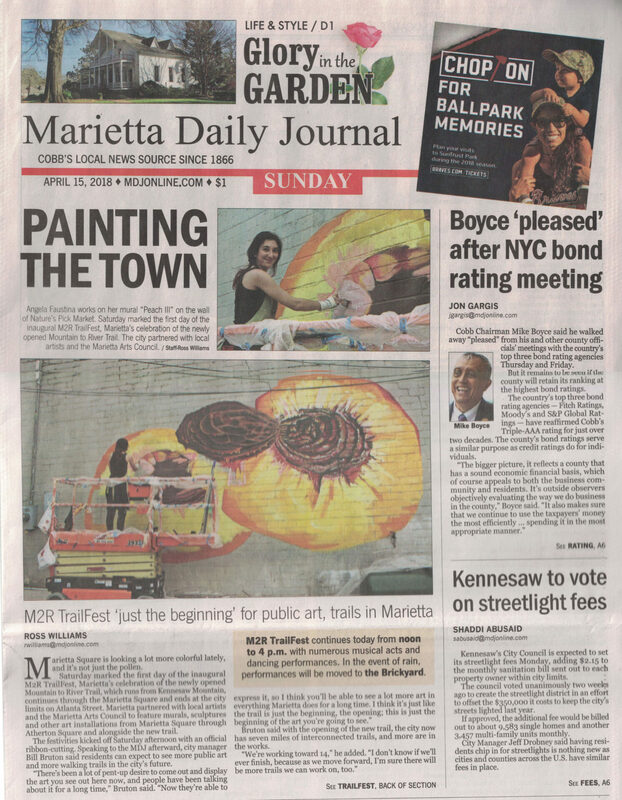 “Painting the Town,” Marietta Daily Journal, April 15, 2018. “Immersive art lines new Marietta trail,” Smoke Signals: North Georgia Arts & Entertainment, April 2018. “2017 Holiday Gift Guide: Support Atlanta Artists!,” Creative Loafing Atlanta, vol. 47, no. 5, December 2017. 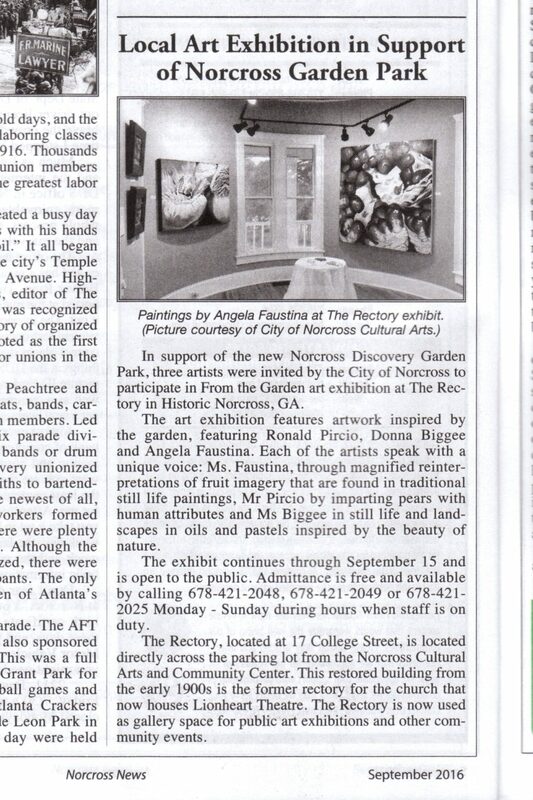 “Local Art Exhibition in Support of Norcross Garden Park,” Norcross News, September 2016. 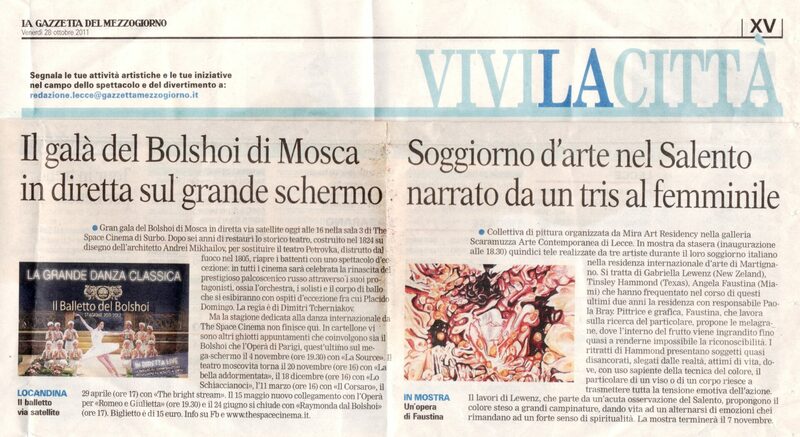 Patrizia Capoccia, “Mira, a Lecce in mostra I dipinti di Faustina, Lewenz e Hammond,” Il Paese Nuovo, 5 November 2011. “Artisti internazionali MIRA Residence,” video interview, Eterarte and MIRA: International Residency for Artists, Martignano, Italy, 2011. “Soggiorno d’arte nel salento narrato da un tris al femminile,” La Gazzetta del Mezzogiorno, 28 October 2011. Dario Russo, “Mira Art Residency – Collettiva d’Arte,” Lecce da Fare, 28 October 2011. Barone, Marcella. “La Galleria Scaramuzza Arte Contemporanea di Lecce ospita l’ultima mostra di MIRA,” Futuratv.it, 28 October 2011. “Mira Art Residency: dal 28 ottobre al 7 novembre,” Il Paese Nuovo, 27 October 2011. Abby Weingarten, “Cultural festival returns to New College’s campus,” The Sarasota-Herald Tribune, 2 April 2009. Hannah Brown, “The Watershed Collective: An art exhibit at New College,” Catalyst Newspaper, vol. XXVI, no. 2, 18 February 2009. “Untitled,” Gouie Literary Magazine, vol. 3, Spring 2008. “Snow,” The Empty Set Literary Magazine, vol. 2, Spring 2007. Art Director and Instructor. Camp Barney Medintz, Cleveland, Georgia, 2008, 2010-2012, 2018. Private Art Instructor. 2016 – present. Visiting Artist and Instructor. Camp Barney Medintz, Cleveland, Georgia, 2016 and 2017. Art Instructor. Kudzu Art Zone, Norcross, Georgia, 2016. Senior Programming Facilitator. Girl Scouts of Gulf Coast Florida, Bradenton, Florida, 2008-2013. Research Assistant. Ringing Museum of Art, Twentieth Century Japanese Prints Exhibition, 2008. Research Assistant. New College of Florida, history department, 2007.